This week we had the opportunity to tour the Fab Factory Recording Studio and speak with each of the fantastic engineers working there–including the wonderful Dave Pensado! The Fab Factory is a 4-room, 3-booth studio owned by Shaun Fabos. Right away, clients and visitors (like ourselves!) are struck by the “vibe” of the space. Art covers the walls of the reception and lounge areas, and the studio actually doubles as a gallery exhibiting twice yearly. Shaun ensures that the Fab Factory feels creative at all times, allowing artists to do their best work in a comfortable space. Michele and I with a daunting wall of modular synthesizers! Rivaling Jason’s synthesizer collection is Michele Canova Iorfida’s! Michele is an Italian producer/engineer I’ve previously met at Sunset Sound, and his room at the Fab Factory is full of incredible gear. Michele has an impressive display of modular synthesizers, like the MacBeth MK1, all sequenced by a Cirklon Sequentix–a device with a year and a half long waitlist! Perhaps more familiar to us rock guys, Michele has a great guitar collection as well, including a Randy Rhoads-style Les Paul and Johnny Marr’s signature Fender Mustang. Dave Pensado is a GRAMMY Award-winning mix engineer. Of course, we also visited Dave Pensado in his Fab Factory home. Dave and I have been friends for many years now and had a lovely conversation about current and past projects, the state of rock music today, some of the equipment/techniques he uses, and much more! Dave mixes almost exclusively in-the-box, but he also has a selection of outboard gear that suits his style. A clever piece is the Bettermaker EQ 232 that opens as a plug-in controlled via the physical unit. Interestingly enough, Dave is also a fan of IK Multimedia’s compact iLoud monitors which I use all the time! Prior to Fab Factory, Dave worked out of Larrabee Studios in Los Angeles where he mixed on an SSL. It was around 2010 that he discovered he was doing better mixes in-the-box than on a console, and by Pro Tools 11, he couldn’t beat what he was doing with a DAW. Of course, Dave champions whatever method best enhances the individual engineer’s creativity, and speaks about the importance of being receptive to new techniques. This might include, for example, using certain plug-ins that allow panning of specific frequencies–a helpful hint he gave us for keeping mixes interesting! Dave shows us the Magic AB plug-in for referencing mixes. Dave and I also spoke about his work on Christina Aguilera’s 2002 hit, “Beautiful.” At the time, Dave allowed bleed from Christina’s headphones into the mix as an homage to the small mistakes he heard on records from his childhood. We both agreed that it’s these “mistakes” that allow listeners to connect to a record on a more intimate level. While he may not have made the same choice today, doing so back then certainly didn’t hurt! 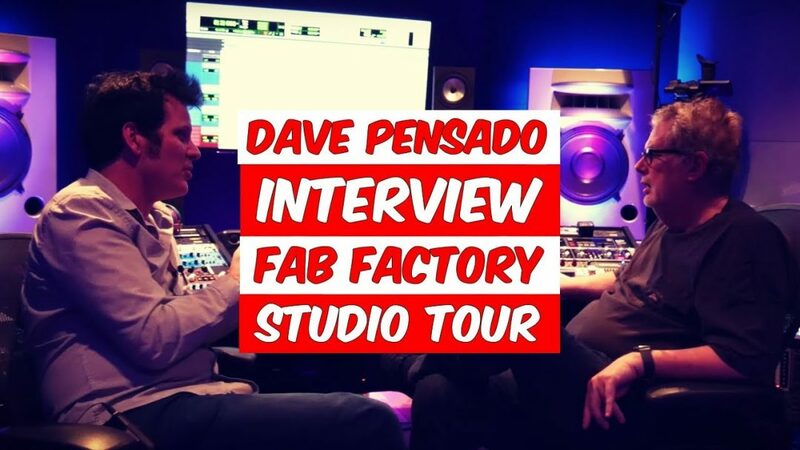 As always, we hope you enjoy this look into Fab Factory Recording Studios and conversation with Dave Pensado.